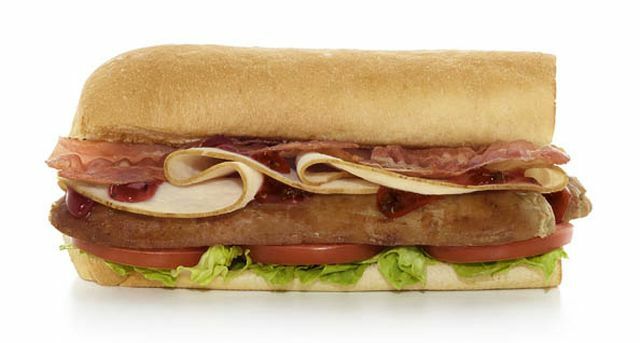 Subway's nod to Christmas this holiday season in the UK is the new Festive Feast featuring a meaty combination of turkey, sausage, and bacon. Specifically, the new sandwich includes formed slices of turkey breast, sausage links, bacon strips, and new cranberry sauce to go with the regular choice of bread and veggies. It's basically the UK version of the Autumn Carved Turkey Sub that we have here in the US. Subway's Festive Feast is available through December 27, 2016 at participating UK locations.